Lean Six Sigma is a highly-regarded and well-proven approach to business process improvement. It is employed extensively in manufacturing and increasingly in service businesses, including Banks, Financial Services and Healthcare. Lean Six Sigma enables teams within the business to engage in continual improvement – working to make the business more effective and more efficient. 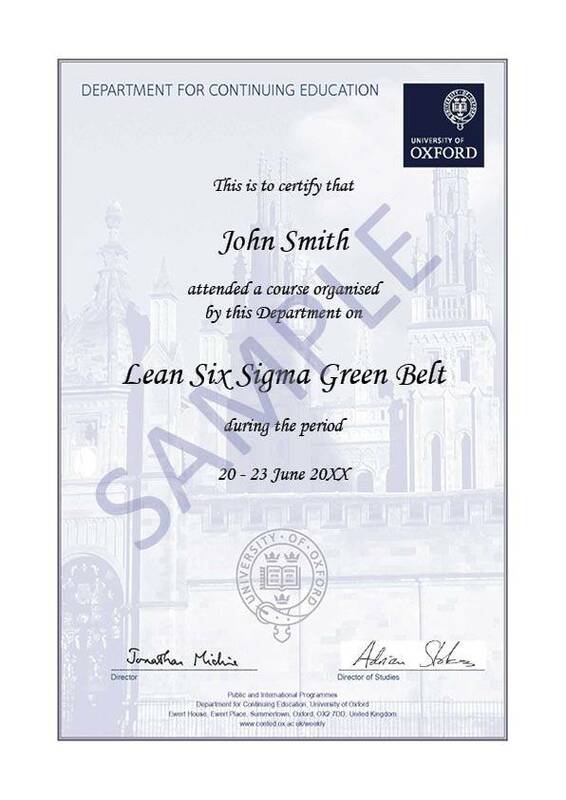 The Oxford Lean Six Sigma Green Belt is a powerful first step to becoming a practitioner of business process improvement. The course introduces the many 'tools' of Lean Six Sigma and shows how these fit together into a framework for lasting and valuable change in organisations. The course is high-energy, engaging and creative. Classroom-based sessions are supported by active, hands-on team sessions in which you will improve a realistic process using the tools of Lean Six Sigma. So you will gain valuable experience of doing Lean Six Sigma as well as knowledge and understanding of the subject. The course provides maximum, useful, actionable information in the shortest possible time. The course will teach you the key ways of thinking and problem solving for business process improvement. We introduce a structure and method for dealing with issues of effectiveness and efficiency within your organisation and for fixing the problems that are identified. The Green Belt course will equip you to begin to practise Lean Six Sigma in your organisation and to affect significant and meaningful change. Lean Six Sigma Yellow Belt: An intensive introduction to the fundamentals of Lean Six Sigma methodology, which will open the door to improving your business processes, smoothing your service delivery and increasing the effectiveness and efficiency of your organisation. 1. A five-day, classroom based component focused on practical skills and knowledge or improvement project execution, delivered in Oxford. 2. A self-paced distance-learning component focused on the analytical and statistical aspects of Six-Sigma. This online component can be completed up to six weeks after the classroom based course. During the five-day classroom based component, students gain practical experience of improvement projects whilst working on an extended practical simulation task. During the course students are trained in new tools and techniques and then encouraged to apply them immediately in a practical fashion to the simulation. No prerequisite experience in business process improvement or Lean Six Sigma is required to complete this component of the course. The distance-learning component focuses on the analytical and statistical tools of Six-Sigma. These skills are best learnt in a self-paced manner that provides maximum flexibility for students learning style and previous experience. Many students will complete this element of the course in around four days of study – depending on previous experience and learning style. Participants who attend the full course will receive a Certificate of Attendance. The sample shown is an illustration only and the wording will reflect the course and dates attended. Although not included in the course fee, accommodation may be available at our on-site Rewley House Residential Centre. Fees include course materials, tuition, refreshments and lunches. The price does not include accommodation. All courses are VAT exempt. Click the “book now” button on this webpage. Payment by credit or debit card is required. Send a completed application form to the course administrator by email or post. Please do not send card details via email. Dr Rob Collins is a visiting fellow of Kellogg College Oxford and regularly teaches courses at the University – both through Continuing Professional Development and through the Computing Laboratory. 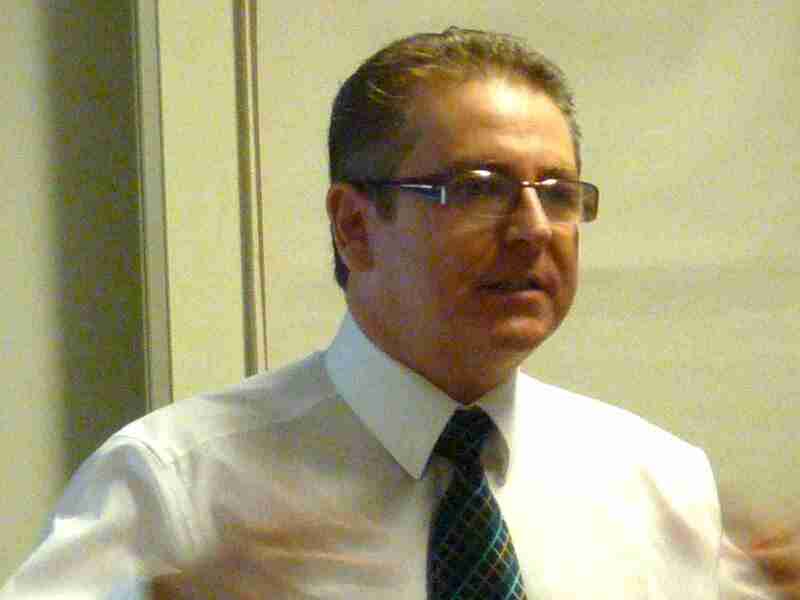 As well as his academic teaching work Dr Collins regularly provides consultancy to industry in the area of Business Process Excellence and Systems Engineering. He gained his Black Belt Certification in Lean Six Sigma from Lockheed Martin – the world's largest Systems Engineering company and a world-leader in advanced technology. As well as his undergraduate degree in Physics and Computing, Dr Collins holds a PhD completed within a Psychology Department. Dr Collins’ PhD focussed on training, psychology and processes for introducing complex technology into learning environments. Dr Collins’ completed an MBA in 2012 at Henley Business School. He thus has a strategic business view as well as deep understanding and practical experience of hands-on process improvement in technology and service. If you would like to discuss your application or any part of the application process before applying, please click Contact Us at the top of this page. If you're uncertain whether this course is suitable for your requirements, please email us with any questions you may have.